I just got this great tank top from BX apparel. 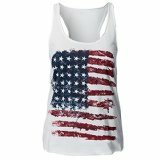 This is the Solilor Womens Stars & Stripes American Flag Tank Top. It is a great design. I love the racer back tank tops for summer, I like to wear them over other tanks and layer them or wear them over a bathing suit. This one is really a great style for 4th of July which will be coming up soon. It has an American flag on it but it’s not a standard flag it’s a sharp edgy version that looks like there is tears in the shirt and it’s showing through, it’s rustic around the edges. The bottom of the tank does not have a hemmed finish so it looks like a rustic style tank top. It is really light weight, so it’s something you would want to wear over another tank top or swim suit, it will be see through. It did fit a little small also, we ordered a large and it was pretty snug. Although the material is really light weight so it easily stretches. You can purchase this tank top on Amazon or on the BX Apparel Store!